It was with amazement that Le Futiloscope recently noted the youthful craze for the bistro Bouillon Pigalle, its deviled eggs, cauliflower in cream sauce and other typically French classics. But clearly we underestimated the phenomenon. Are the millenials rediscovering home cooking? Their parents too ! On the menu of L’Ile, the new hot spot on the Ile Saint -Germain, we’re regaled with leek-deviled egg, after having sipped an “anise aperitif” (like grandpa) and awaiting the “raspberry melba” for dessert. Leek in vinaigrette sauce, celery remoulade, the humble white fish, are now on the menus of all of the popular canteens, from the Mermoz, nearby to the Elysee Palace, to the Zebra, neo-brasserie in the 16th arrondissement, and an adept of the weekly menu (bangers and mash, pork chops: eat-repeat). Because after the “broth” and the “truck stop” eateries, resuscitated by up and coming young restaurateurs, it’s the brasserie, its more middle-class version , but every bit as “typically French”, that has come out of retirement. They’ve been given face-lifts and they’re back in spades! Astair in the Passage des Panoramas will open in the fall. The décor will be “modern bourgeois”, with lots of ironwork covered in gold leaf, done by “artisans of art” (another national treasure). “What we are looking for”, one of the founders assures us, “is to re-stimulate Parisians to eat snails in evening dress, a cocktail in hand”. Maybe they should take fox-trot lessons too? 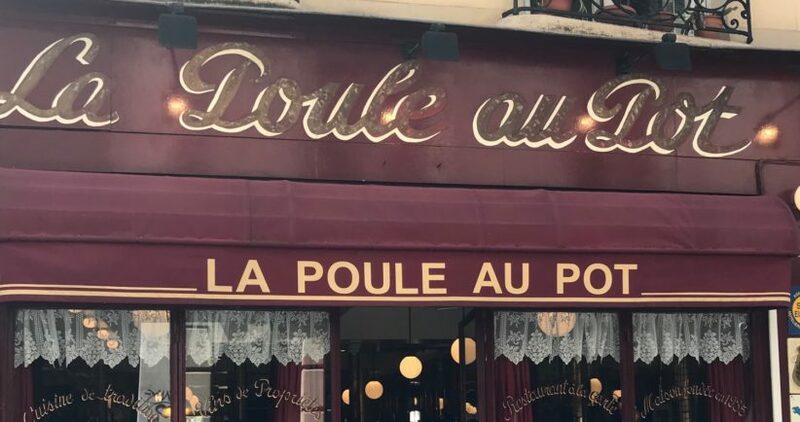 And now, here’s the latest scoop: Jean-François Piège is taking over “La Poule au Pot”, a venerable institution in Les Halles for the last 80 years. Besides the chicken, so dear to Henry IV (and on the menu every Sunday) they serve Veal Stew (do we need to specify “traditional”?) , frog legs à la persillade and…once again – snails! They’ll bring out the silver and bone china, just like for a banquet under the 3rd republic pre WWII. The deco? Wallpaper, hanging lamps, tiled columns, they didn’t change a thing. The chef says he always dreamed of a place where one could cross paths with Jean Gabin and his pals. Maybe he could install their holograms in a booth. But wait, I’m confusing it with the Musée Grevin. Yesterday’s brasseries? We didn’t go often, mostly we sent our American or Japanese buddies to soak up “local culture” (and crepes Suzette). The brasserie 2018? It over-emphasizes the ”French exception”, its heritage and its repertory. Like a time capsule or a diorama (a dinner in Paris circa 1950), we are plunged into the heart of the retro cliché that foreigners already have of Paris. It’s deliberate, of course. All the same, between this and the basic bistro that dreams of being cited in the Unesco Heritage List, the trend toward turning the capital – and its cooking – into a museum is accelerating. We can see it ending up like in “The Map and the Territory”, where the visionary Michel Houellebecq threatens to see his whole country becoming an amusement park for Chinese tourists. But don’t let yourself be discouraged by all this! Have another snail, and to soak up the sauce, there’s always a baguette!